Almost one and a half years later with the ambitious and slightly underrated Season 4 under my belt things have changed. My interest in the franchise has gone through an on and off renaissance, and in general I’ve gotten a lot more perspective in my life. My enthusiasm for Rainbow Rocks was admittedly still pretty mild, but after listening to the soundtrack I found myself listening to my absolute favourite Daniel Ingram works yet. My enthusiasm increased sizeably. Boy am I glad to say that even those expectations were exceeded. Rainbow Rocks truly delivered in so many ways that the first movie never did, most importantly in being a movie that had the ambition and the love to truly feel like a theatrical release and not a glorified straight-to-DVD spin-off. We’re back at Canterlot High, to which protagonist Twilight Sparkle is brought back to through a ret-conned but quite thematically meaningful plot device in Sunset Shimmer’s old journal to Princess Celestia. 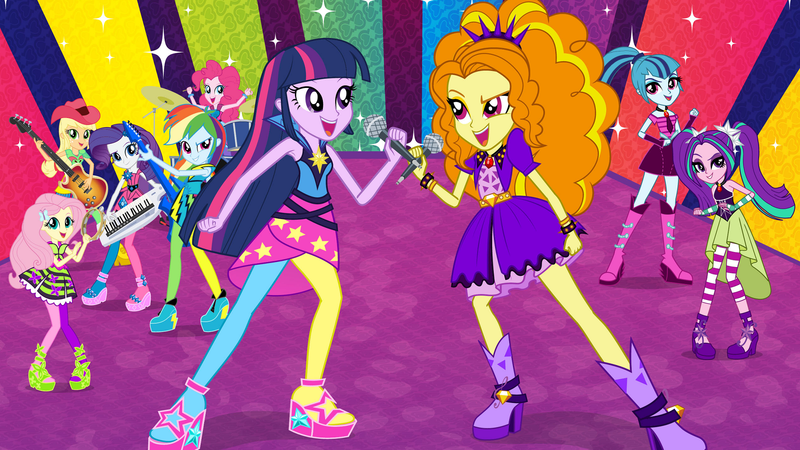 Our villains this time around are ‘The Dazzlings’, three mysterious girls whose appearances seems to remind me and others of the characters from the Monster High franchise that Hasbro have been trying to compete with using these Equestria Girls, and who have the ability to manipulate people through their singing. The Dazzlings wish to take control of the Equestrian magic of our six main characters, and manipulate their way to setting up a Battle of the Bands at Canterlot High to do so. The Dazzlings themselves are probably among the most interesting villains in the entire franchise. Similar to Discord in that they seem to be functional polar opposites to the main characters, but less obvious and actively comedic. There’s a lot of nuances that show this. Whereas the main conflict of the protagonists is overcoming personal disputes, The Dazzlings are content with bickering to the end. Sonata Dusk, my personal favourite of the three, is a bumbling loudmouth who almost reveals their plans a couple times. Aria Blaze is the petty bickering foil to Dusk, and doesn’t appear to trust the leader of the group, Adagio Dazzle. The fact that the group is lead by a rocky hierarchy shows what’s fundamentally wrong with it. They get their own nice little storybook mythology backstory that many of the main villains of the series got, except there’s a little more visual indulgence as is appropriate for a theatrical release, during which they’re revealed to be mythological creatures known as ‘the Sirens’, who were banished from Equestria by Starswirl the Bearded and found themselves in the Equestria Girls universe trying to get by on crappy fast food until they discovered the Equestrian magic and Canterlot High. Their characteristics are expressed quite vividly in their music. Rather than the feel-good upbeat songs with almost equal vocal collaboration from each member like the main characters’ band, The Rainbooms, their music has a slow hypnotic vibe interspersed with sleazy rebellious contemporary pop, with Dazzle front and center on vocals and the other two simply doing harmonies. That brings me to the music itself. As I aforementioned, the soundtrack was an instant favourite of mine amongst Ingram’s work with the show. It all feels much tighter than the first movie, and much more passionate. To boot the visual choreography that goes with each song is fantastic. The vivid intro sequence with the eponymous title track was absolute thrilling, as was the visual dramatisation of the Battle of the Bands during one of the Dazzlings songs, ‘Under Our Spell’. As awesome as those songs and their imagery are to see in action, the song that takes the cake for sheer musical bliss is the ending theme, ‘Shine Like Rainbows’. It moved me the first time I heard it and it moved me upon hearing it over the credits sequence. There’s a great deal of attention to detail in a lot of the scenes, with all the callbacks relating to what happened in the first movie and in Season 4 being accounted for. They even make some neat references to a couple of the shorts in one scene. There’s also a lot of distinct quirks in the character interactions. Background gags, foreground gags and a few little touches in their poise that spice things up. My favourite instance of attention to detail comes after the credits, so stick around. The rich character focused narrative of Rainbow Rocks is yet another aspect that improves over the predecessor. It capitalises largely on the fact that these characters aren’t as well developed as their series counterparts as we haven’t been with them anywhere near as long. We see some fun scenes where their differences cause dispute and their archetypal personalities lead to comical arguments, reminiscent of some of Season 1’s best episodes. Whereas in the first movie the retread of familiar ground is offset by Twilight, this time around we get a refreshing change in Sunset Shimmer. In the first act of the movie there’s a running gag where they’ll accidentally remind her of her evil doings in the first movie and make her feel guilty for it. Though it does get repetitive, the payoff is nice. One scene in particular that I really liked involved her responding to one of the inadvertent reminders by smiling warmly and replying “It’s okay, I’m used to it.”. That line sets the tone for her development throughout the movie. Though she did once become corrupted, Sunset Shimmer continues to stick to the side of the main characters, even at times showing herself to be the strongest willed character in the movie. Shimmer gets her big moment in the climax of the movie, and what an amazing climax it was. Nearly every other story in the Friendship is Magic franchise that has involved a villain has had a climax that came almost immediately after the friendship conflict was overcome. This time around, we get a feeling for the Dazzlings as being one of the biggest threats that Equestria has ever faced. The extended theatrical length is put to better use than the first movie and the pacing is tightened, giving us an incredibly satisfying climax involving a back and forth musical battle with The Rainbooms and The Dazzlings which concludes with Shimmer choosing to stick by the main characters and finally fully redeeming herself both in her own eyes and in the eyes of her peers. Regretfully, I have to admit there’s still a few problems with Rainbow Rocks, the most obvious one being the fact that the Equestria Girls universe will simply never be as interesting or wonderful and the universe of the main series. Flash Sentry, one of the worst stinkers of the first movie, reappears here, and though his role is reduced he’s still equally as insipid a character with equally the insipid purpose of being a vapid love interest for Twilight. I would argue that you would be delusional to say that the main series has lost its charm and gotten shallow and cynical, but I can never ever deny just how charmless, shallow and cynical the sheer presence of Twilight Sparkle’s flirty relationship with Flash Sentry is. If things like that didn’t totally ruin the first movie for me, they certainly weren’t going to ruin a much better movie like this for me. Equestria Girls: Rainbow Rocks gives me a whole lot of hope not only for the future of the TV series but even for the future of the movies I previously had so little hope in. It’s a step forward for the franchise with all the love that a movie of the Friendship is Magic franchise truly deserves.